Idyllwild, California, a mile high up in the San Jacinto Mountains above Palm Springs, is one of those pretty little mountain towns you always hope to find and seldom do. It’s artsy, quiet, cozy. It has no ski-lifts, no lake, no factory outlet stores. Just pine-fresh air, a clutch of hiking trails, a burbling creek running through town. It has wine-dark night skies, gorgeous mountain views, and friendly people moving at a slowish pace. And over it all, the dramatic white dome of Lily Rock glows down just to make you gasp once in awhile at her beauty. Idyllwild’s also got The Red Kettle. In fact, it’s had this rustic local eatery for almost a century. Back in the 1920s, it first opened as an ice cream shop and soda fountain, then became a full-fledged diner in the ‘40s. 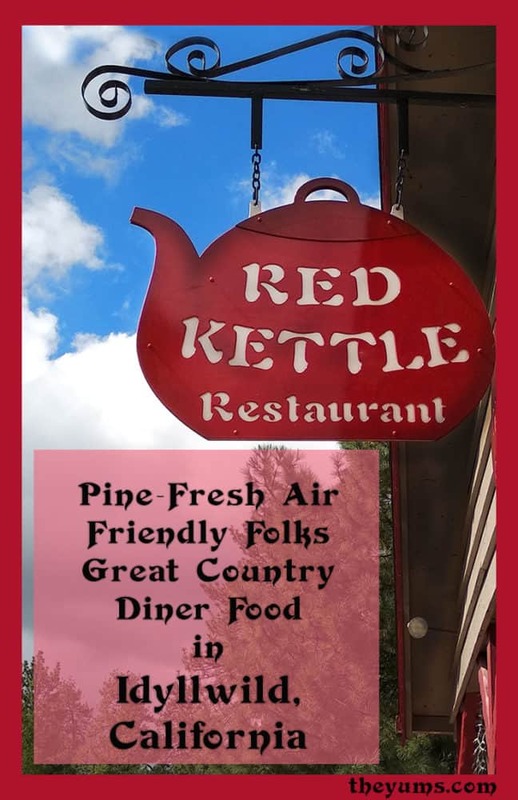 Today, The Red Kettle prides itself not just on its friendly “How ya doin’” service and good food but also on its status as part of the Idyllwild Historic District. Menu: What you get at The Red Kettle is good, fresh-made and old-fashioned country diner food for breakfast and lunch. The breakfast menu includes all the diner standards you’d want—like bacon and eggs, hash-browns, pancakes, home-made biscuits and gravy, and more. At lunch, look for soups and sandwiches—hot and cold—plus burgers, salads, and such old-time goodness as a patty melt or fish and chips. Thoughts: There’s nothing slick or modern about The Red Kettle, and you wouldn’t want there to be. It’s homey and clean, bright and comfortable, the kind of place where you expect all the waitresses to call you “Hon.” It’s busy and talky, a little noisy, and very much alive. It’s magic lies in how it so effortlessly transports you back to a slower, easier time of casual and filling diner food, where neighbors hang a long time over their third cup of coffee and strangers are welcomed as friends. The walls are covered with funny and sarcastic signs and trinkets and photos of the town. Red-and-white checked gingham valances top the big windows, which let in lots of sun to bounce off the wooden tables and chairs and long wooden counter. The day’s specials are listed in multi-color on the big whiteboard behind the counter, and the coffee pot is always ready to fill your bottomless cup. I’ve been coming to the Red Kettle since I was a teenager (a very long time ago) and not much about it has changed, though the name of the place has gone through a few permutations. It’s the perfect spot to pack in some hearty fare before a hike up the mountain or top off a trek back down with a burger and a beer. Portions are on the large side, without being overwhelming, and prices are reasonable for a mountain town, where everything has to be trucked up a twisty two-lane road. The menu is pretty massive, but let’s hone in on a couple of things, starting with breakfast. If you’re hungry—and I mean really hungry—you might want to opt for the Junkyard Omelet. This one is loaded! Tucked inside its four egg fluffiness you get shredded steak, onion, tomatoes, bell peppers, mushrooms, and American and cheddar cheese. Equally filling is what many have called the best chicken-fried steak they’ve ever eaten, perfectly breaded and crisp, smothered in home-style peppery country gravy and served with double eggs. Or maybe you fancy starting off with the giant cinnamon roll covered with a mountain of icing. You’re gonna need that hike! Personally, I think the corned beef hash is everything. When I’m feeling righteous and want to opt for something a tad healthier, I choose the Old-Fashioned Oats. Your bowl comes with a tray of brown sugar, cinnamon sugar, nuts, and raisins, and your choice of toast or biscuits, with a side of fresh-cut fruit. At lunchtime, the focus shifts. I always peruse the entire menu but usually end up ordering my favorite since childhood, the chili size, a 1/3 lb. Angus hamburger served open-faced, smothered with homemade chili and topped with cheddar cheese and chopped onions. There’s also a wide-range of ways to dress up the hamburgers. Add some bacon, avocado, regular or Swiss cheese, mushrooms, Ortega chilis. There is also a veggie burger for vegetarians, and gluten-free bread can be ordered instead of the regular bun. When I want to change from my usual, I like the halibut fish and chips or the Reuben sandwich. In winter, when the air is frosty and snow covers the ground, a bowl of the chef’s home-made soup of the day is always a treat. If they’re serving white-bean or split-pea soup the day you’re there, you’re in for a real treat. Add a piece of cornbread to make it perfect. Another favorite with many is the half-sandwich special– half a turkey, tuna, ham, or egg salad sandwich with a cup of homemade soup or chili and half a slice of homemade pie. And about that pie…. All the guidebooks and local hosts in Idyllwild tell you to be sure to eat pie at The Red Kettle. They know what they’re talking about. The choices vary with the seasons but some of the ones I’ve had over the years include boysenberry, peach, rhubarb, pecan, and pumpkin plus a luscious sugar-free apple pie. The crust is flaky and perfect, the filling rich in flavor and never too sweet. Get it a la mode if you want to really do it right. In nice weather (which means not in winter, since it snows here quite a lot), there’s seating on the front porch. It offers great people watching as the restaurant sits right in the center of the main part of town. The staff is a friendly lot, though they are kept running at busy times. Food generally makes it out of the kitchen quickly, still piping hot. There’s a kid’s menu and the Red Kettle is family friendly. There is almost always easy street parking nearby. Open for breakfast and lunch only. Prices Range: At breakfast, combos run from $7.95-9.95. Add a home-made biscuit and gravy for $2.50 more. Chicken-fried steak and eggs costs $9.95 Omelettes are $9.95-10.95 and up to $12.95 for the Junkyard. Buttermilk pancakes start at $4.95 for one and go to $7 for three. A half-order of French toast is $5.50, a full order is $7. A large bowl of the Old-Fashioned Oats with fresh fruit and all the fixings runs $7.50. Some examples of lunch prices include Chili Fries for $6.95, a soup or chili and salad special for $8. My favorite Chili Size is $9.50.Fish and chips are $11.95. A big Chef’s Salad is $9.95. Hamburgers run $8.95-10.50. Other sandwiches, hot or cold, run $8.25-9.95. A piece of pie is $4.00, or $1.50 more for a la mode. Beer and wine are also available.